If you want the latest and greatest tablet Apple has to offer, you can now find the iPad Air 2 available on store shelves. Apple debuted the new slate last week with some subtle outside improvements over last year’s iPad Air and larger changes inside. 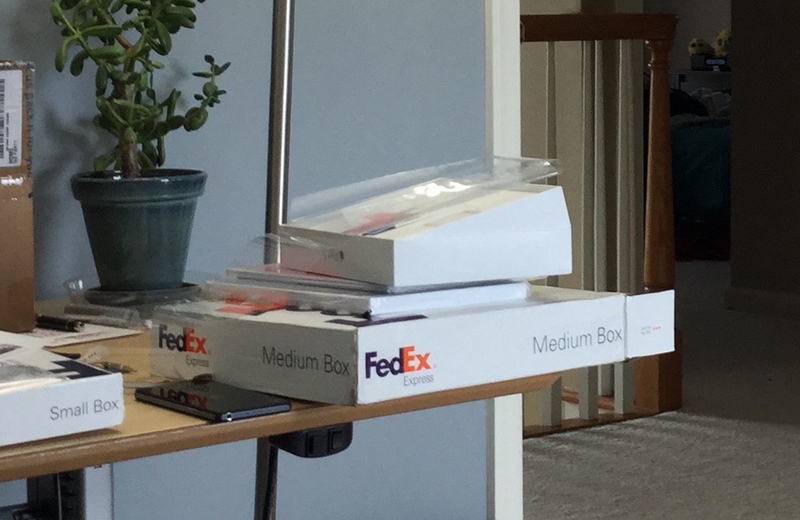 [company]Apple[/company] sent me an iPad Air 2 review unit yesterday and I can share some initial thoughts now before writing up a longer-term full review. 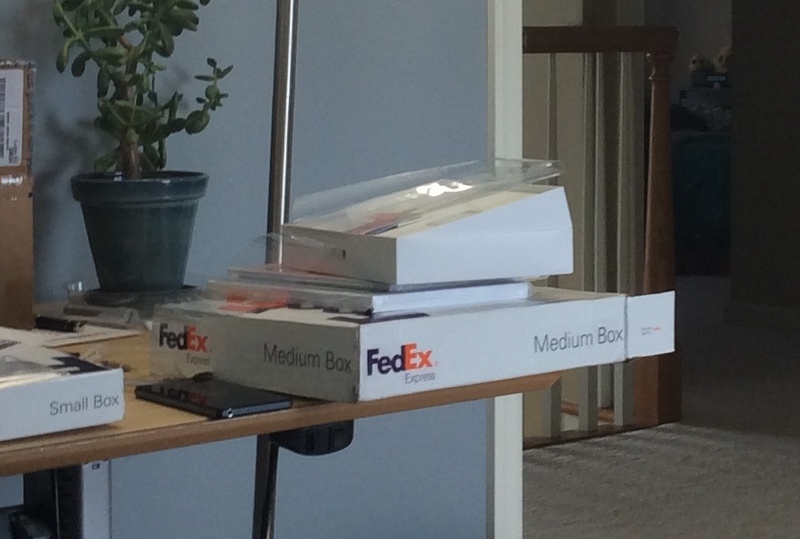 The loaner iPad Air 2 is a gold 128 GB model with [company]Verizon[/company] LTE service. I currently own an iPad Air that I bought last year that connects to [company]T-Mobile[/company]’s LTE network. Aside from the new Touch ID sensor on the iPad Air 2, you’d be hard pressed to see many visual differences at first glance. The gold color is new, of course, and is more of a champagne tint than a bright gold. I can also see that Apple moved the external microphones on the newer model. There are two small mic holes on the top and middle rear of the iPad Air; on the iPad Air 2, those are both near the camera. Apple says it reduced the iPad Air 2 thickness to just 6.1 millimeters compared to the 7.5 millimeters of last year’s model. 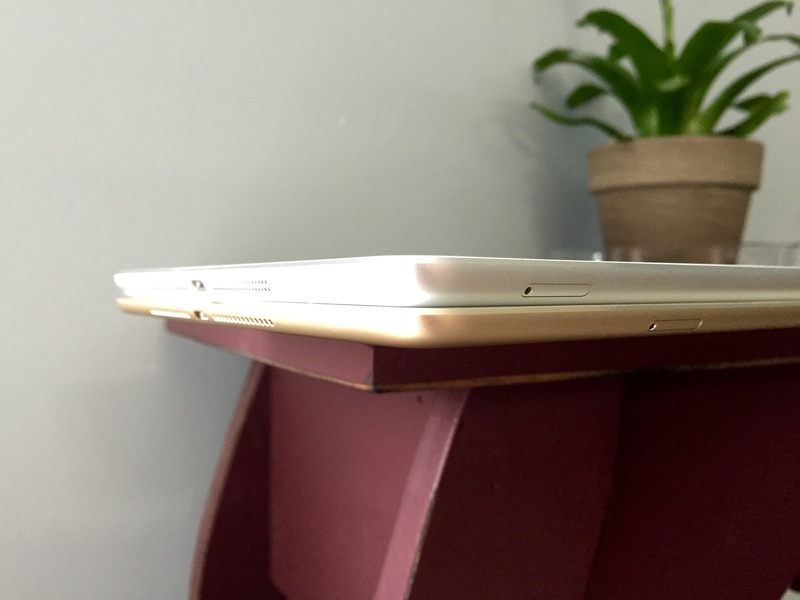 You can see this slimness putting the two tablets side-by-side and you can also feel when holding both. The Wi-Fi plus cellular iPad Air 2 also weighs 43 grams less than the iPad Air but to me it’s not a noticeable difference. 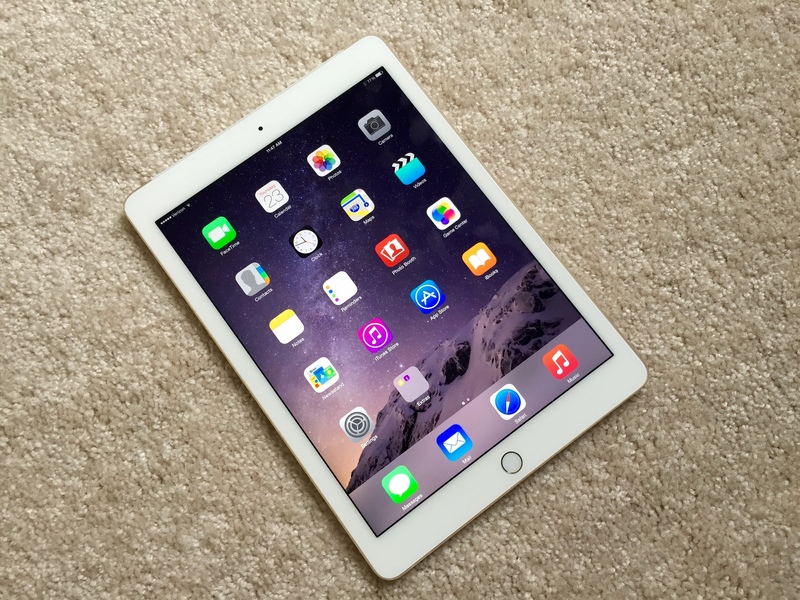 The thinnness of the iPad Air 2 has the larger impact: It deceivingly feels like you’re holding a display and not a full tablet computer. And at some point, Apple will likely have to move to using the lightning port for headphones; it’s simply running out of room to use a standard 3.5 millimeter jack. The iPad Air 2 didn’t get a resolution boost; it has the same crisp 2048 x 1536 resolution as the iPad Air. Apple optically bonded the screen, however, moving the display closer to the glass surface. Is it noticeable? Yes; it appears more like you’re touching icons and buttons instead of touching glass with elements behind it. And if you tilt both iPads, you can see the reduced gap between the display and glass all along the screen edges. It could be “old age” but with both tablets set to full brightness, the new iPad Air 2 looks a slight bit brighter than my old iPad Air as well. Inside the iPad Air 2 are the bigger changes; some of which will require longer term testing. But I can see some obvious improvements right away. Added support for 802.11ac Wi-Fi definitely speeds up data transfers on my home network where I have an 802.11ac router. A download speed tests showed 69.29 Mbps transfers on the new iPad Air 2, which is nearly the full 75 Mbps home broadband speed I get from Verizon FiOS. 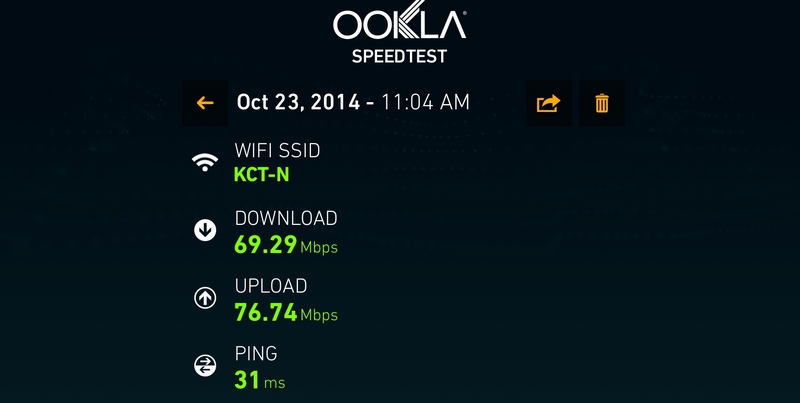 Last year’s iPad Air averaged around 29.47 Mbps from the same testing location on my network. There’s also the new A8x processor and its 3 billion transistors found in the new iPad Air 2. By comparison, my old Air uses the A7 chip first seen in last year’s iPhone 5s. In the short time that I’ve been using the newer tablet, I can’t say that I’ve seen a huge performance difference between the two. Opening the same apps simultaneously happens a split-second faster on the iPad Air 2, for example. I’ll have to do some iMovie video rendering and other performance-based scenarios for a better comparison. The camera is much improved on the new iPad Air 2 based on my initial first look. Apple upgraded the old 5 megapixel sensor to a new 8 megapixel rear camera and I can see a fairly obvious difference when taking pictures. Images from the iPad Air 2 are generally more clear, brighter and — as you’d expect with a higher resolution sensor — cropped picture areas have more detail. So far, pictures from the iPad Air 2 don’t look quite as good as those taken with my iPhone 6 (which also has an 8 megapixel sensor) but the quality gap isn’t that large. Here’s a look at a cropped image from a picture of my messy home office desk using both tablets with default camera settings. That’s all I can share for now based on my limited time with Apple’s newest tablet. I’ll have more to say about it as I spend additional time using it in the coming days. So far, I’m not yet seeing a compelling reason to upgrade from my iPad Air, although those with older models might. With the screen closer as you described do you think that those of us using stlyli like the Adonit script will get a slightly better experience ( nib lining up with screen ink) ? With the screen closer as you described do you think that those of us using stlyli like the Adonis script will get a slightly better experience ( nib lining up with screen ink) ? Great read. I own an iPad Air and I honestly love it – and despite genuinely loving some of the improvements with the Air 2 – and don’t plan on upgrading this year. Thanks for posting this. I need to finally break down and buy one of these. Could you comment on the Apple-SIM. How does the process work? Could you mention the first 6 digits of the 15 digit IMSI number that might be printed on the SIM. Can you tell us whether you can switch operators? So can you buy a Sprint and a T-Mobile subscription at the same time. His loaner is the Verizon model, which I think is the only one that doesn’t have that ability. Bingo. This unit came with a pre-activated Verizon SIM inside it.